Now I decided this year that New Year is an event that requires a cake. And as I had received a Great British Bake Off recipe book this Christmas, I went straight to Mary and Paul to find a showstopping bake. 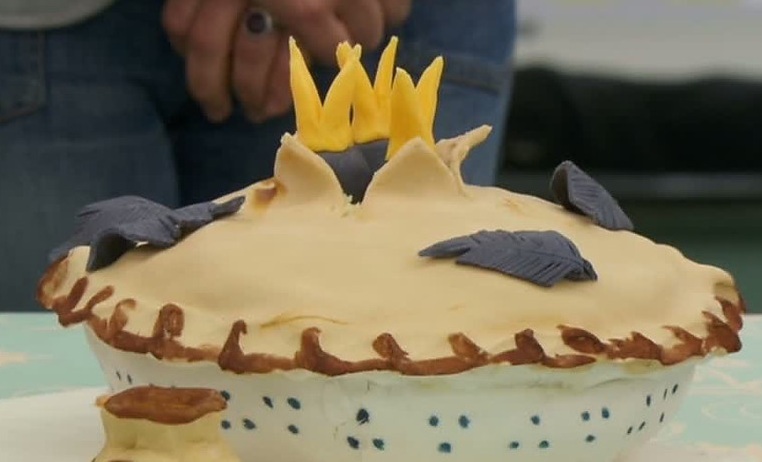 Isn't that an impressive cake? And not nearly as hard to make as it looks. Mine doesn't look exactly like Mary's, but it all got eaten before I could swipe myself a slice, so it must have tasted pretty good. And this tasty-looking zebra cake, a recipe for which can be found here. If you want to make the Chess Cake you will need piping bags, and at least two sandwich tins of the same size, preferably three (Mary says 20.5cm). You can find disposable piping bags in most decent-sized supermarkets in the baking section. You can get nylon piping bags in specialist baking shops but I can't be bothered with washing piping bags out so I shall not be buying them. Ever. Also, if you do not have two sandwich tins of the same size, you can sometimes hire them from baking shops. Now, Mary would have you make the chocolate curls by tempering chocolate, which makes it shiny and stuff. But to Mary I say: "Mary, I am a busy woman. I do not always have time to temper chocolate. Not today, Mary." And so I have given you another (much easier) method to make chocolate curls. 1. Put the butter in a large mixing bowl or in the bowl of an electric mixer. Beat until creamy, then add the sugar and beat until mixture becomes light in colour and fluffy in texture. 2. Add the eggs one at a time, beating well after each. For the last 2 eggs, add a tbsp of flour at the same time to prevent the mixture from curdling. 3. Sift in the remaining flour and salt and fold in gently using with a large metal spoon or spatula. 1. Preheat the oven to 180C/gas 4. Grease both tins and line the bases with baking parchment. Make up the sponge mixture as above. Transfer half the mixture to another bowl, add 2 tbsp of milk and sift in the cocoa before folding it in gently. Add 2 tbsp of milk and the vanilla extract to the other mixture and put each mixture into a piping bag. 2. Pipe a ring of vanilla mixture around the inside edge of one tin. Then pipe a ring of chocolate mixture around the inside of that. Repeat with alternate vanilla and chocolate rings until the tin is filled. For the third tin, start with chocolate so it is filled with the reverse of the other tins. If, like me, you only have 2 tins you will have to bake the sponge in those tins and then reuse one. 3. Bake the sponge mixtures for 20-25 minutes until lightly browned, well risen and until a metal skewer inserted inside comes out clean. 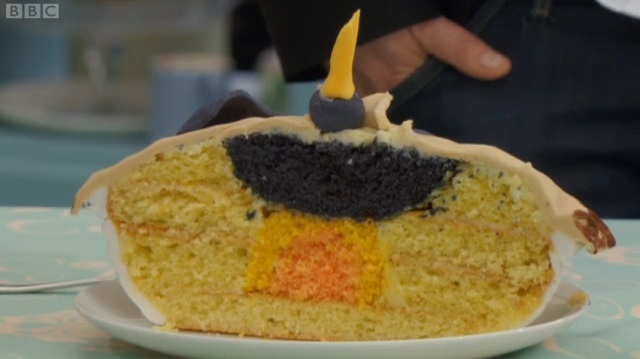 If you have wider tins your mixture will be shallower and it will not need quite as long. Run a knife around each tin to loosen the sponge, then turn it out onto a wire rack to cool. 4. Make up the white and dark chocolate ganaches by placing the ingredients for each in a bowl above a saucepan of barely simmering water. Heat gently, stirring occasionally until cream and chocolate become completely combined in a smooth ganache mixture. Take off the heat and leave to cool until easily spreadable but not set. 5. After the sponges have completely cooled, place one of the 2 identical sponges on the plate you intend to present it on, and spread the top with white chocolate ganache. Then place the reverse sponge on top and spread that with ganache before placing the final sponge on top. 6. Spread the sides and top of the cake with dark chocolate ganache, cleaning any drips off the cake board or plate with a slightly damp cloth or kitchen towel. Place somewhere cool to set (not the fridge). 7. To finish, make chocolate curls by melting the butter and chocolate together in a bowl above a saucepan in barely simmering water. Then pour the mixture into a rectangular container out of which it can be easily pressed, and put in the freezer to set. 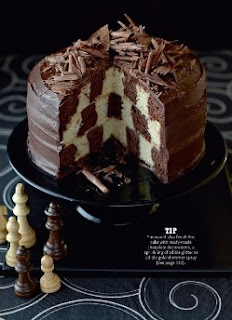 Once set, use a vegetable peeler to slice large chocolate curls off the chocolate block onto the cake. Hold the block in some folded kitchen towel to protect it from the heat of your hand. If like me, you are badass, finish the cake with edible gold glitter, and a sparkler. Or two. Not the neatest slice in the world but you get the idea. Again, I apologise for poor-quality photos. When I am a famous baker-journalist I'll get a professional to take my photos. 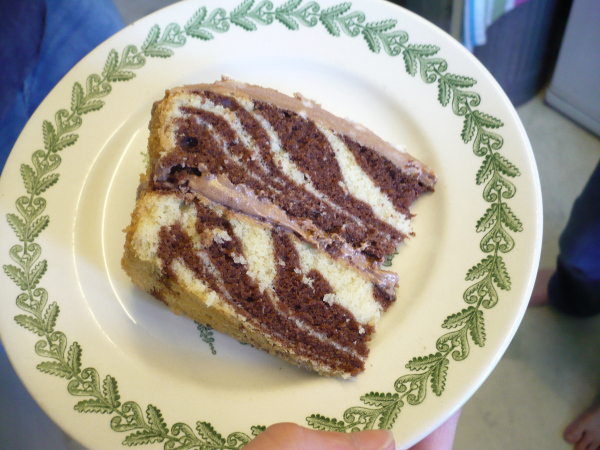 It was very tasty - but there is a neater way to get the checkerboard effect (sharper edges than the piping method, and it'll make sure your checkerboard cross sections line up better than even Mrs B's photograph!). Ah yes, well I could have done that but I only had a couple of hours in which to make it, I don't think I could cut that neatly, and I was pretty happy with how it turned out, actually.